PHPRunner 9.0, ASPRunnerPro 9.5, ASPRunner.NET 9.0 released (July 22nd, 2016). Important: if you purchased PHPRunner, ASPRunnerPro or ASPRunner.NET before July 1st 2015 you have till September 1st, 2016 to use discounted upgrade option. After September 1st, 2016 you will have to purchase software at the full price. Do not miss your chance to upgrade for less. This is a menu page upgrade. Once finished it will look like this one, you will be able to choose a several most important menu items and display them on start page along with short description. Once finished it will look like this. Right now it only appears on List pages. Will be added to Add/View/Edit pages as well. We added an option to display number of details in nice rounded colored badges. When you need to Add or Edit master and details together you can just drag-n-drop details tables where they need to appear. And this is how it looks in generated application. 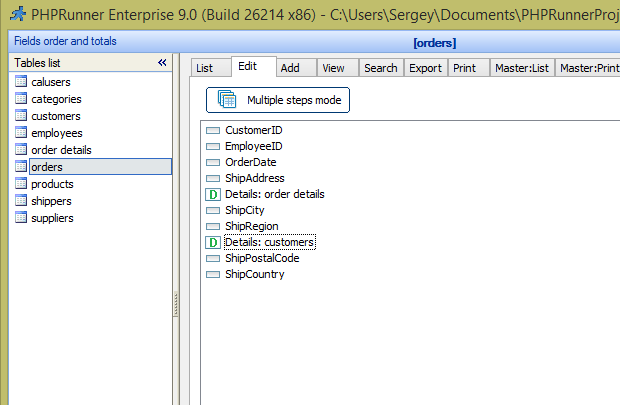 This feature will be available in PHPRunner only and desktop apps will run on Windows only. We'll see if this can be extended to other platforms. This is, apparently, PHPRunner only. We upgraded to AnyChart v7 for charting purposes. Better look, better performance, native HTML 5 charts. This is a great addition to PHPR! Developers will no longer need to circumvent the native templating behavior to get a clean and polished look. Well done Sergey & Crew… I can’t wait to try the Beta. 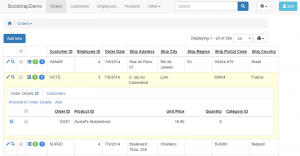 This feature will be available in PHPRunner only and desktop apps will run on Windows only. We’ll see if this can be extended to other platforms. By the way, AWESOME job!!!!!!!!!!!!!! i like boostrap templates i have the php.net runner enterprise, my question is, do i have to pay for those templates, if so how much? sorry i mean asp.net runner pro. That download is no longer available but it’s going to be a part of PHPRunner. Bootstrap is really great news! Thanks for your constant improvements! Great news. I’ve been developing with PHPR for more than 5 yars and you always find ways to improve the product. Way to go. It can only get bette from here!! Keep it up guys!! Great job. With bootstrap, I am getting back to use phprunner for my professional projects. happy to see the new Improvements in the template options but I am sorry I am not impressed because having bootstrap means its also a mobile responsive site with theme colors changeable using the theme.css file of bootstrap. I tried looking at the demo in browser mobile responsive layouts … and it didnt changed its layout at all. Looks great. How much rework will be necessary to move a PHPrunner 8.1 implementation to PHPrunner 9. Will it reset each page to default? 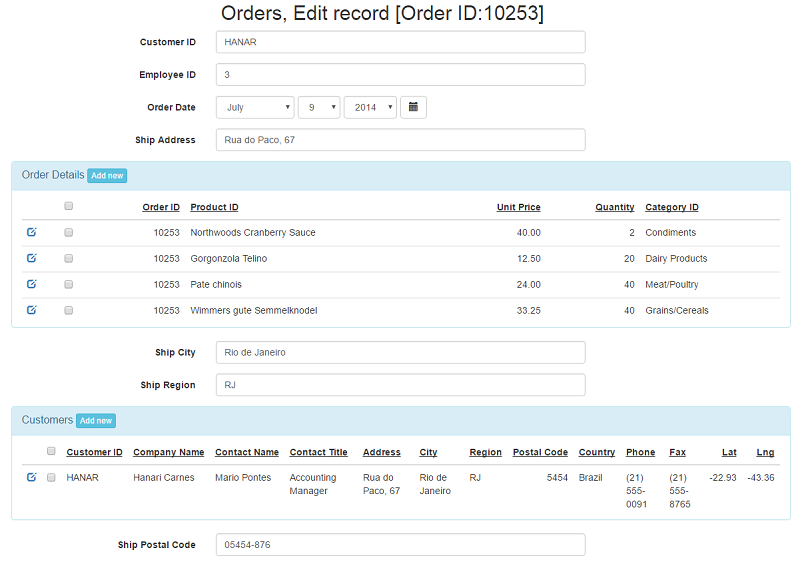 I am in to Bootstrap recently and finding it in PhpRunner is great. PHPRunner already have this, it is called Vertical Mode of the List page. Bootstrap is great! This is a wonderful addition, thanks Sergey! But I have always thought of Bootstrap as responsive and Mobile First. PHPRunner has a separate Mobile Template. I’m not sure I understand how this is going to work. Could you describe it for my small brain please? Bootstrap will really give that extra edge to an already great tool. Been hoping templates would go this way at some point. Thanks for moving the product forward so well. This template does appear to be responsive. The tables as they are designed in this demo are not good for mobile. I assume we could use vertical for mobile pages. Would appreciate any info on pricing for the new edition, and whether it will be beneficial for us to get licensing on the new version or upgrading from the previous version? I was going to purchase the current version of PHPRunner this week. As you noted, prices may be going up. If I purchase it this week or next prior to the final release, will I be eligible for the 9.0 version or required to pay yet an additional cost? AES encryption option… Awesome, I love it! When I press BUILD button info that only 200 build are allowed but nothing happens!!! congrats!! 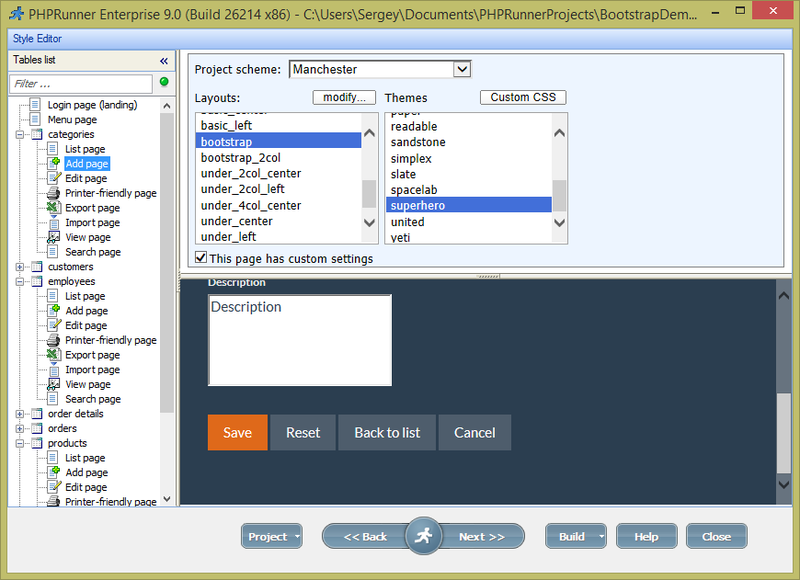 The bootstrap-integration is a very helpful feature in php-runner. You and all of your staff did a very good job! I fear, now is starting the longest timeperiod in history of menkind: the next few days up to the final 9.0 …. I can hardly wait for it! Thanks for offering another excellent stuff, we actually are in need of that kind of improvements. I currently would like to highlight some general issues (not relating to version 9), you may consider them as Suggestions. 1. 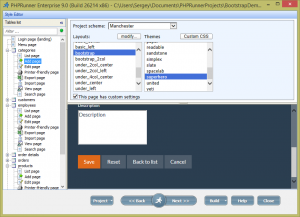 PHPRunner has settings options, which are once checked are available for every project. Please Add Date_Time zone drop down in settings, so we can make some region as default instead of adding code for each project in after app init event. 2. Also add Date, Time, Currency and Number Format/options in settings, so we can configure them once and they are available for all projects, instead of changing them in misc and visual editor screen. 3. Also please consider adding default calendar option in settings. Currently we have to change default pop up based date_time calendar by clicking on each date field. 8. You may also redesign the start screen of PHPRunner (means in single screen you can show recent projects, templates icons and new project creation options, instead of displaying them in two columns. I’ve downloaded PHPRunner V9.0 and will get back to you once i finished testing it. Great development. I have tested the beta version and really cannot wait for the full release. Well done! Awesome update features, great work xline. great work, I wish Bootstrap templates to support right to left (RTL) better than it is now. Awesome update, looks very nice. Great job! In PHPRunner 9.0 build 26521 , register (register.php) can’t add a new user properly. truly the ever best decision taken since long, here to jump into the “looks pretty, shines truly” responsive screen arena as indeed such optical update was over-due since long in regard to world’s best RAD tool ever. Say, while developers are mainly focussed on coding issues, the consumers don’t and are judging a product by its good looking shape. Many congrats from my end on this, stay tuned. 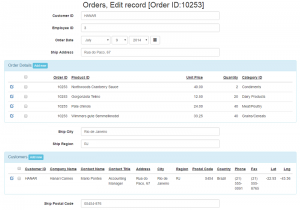 I think is the step in the way to be the best dbase php generator of the market. thank you. I didn’t see an option for the desktop apps in the beta. It will be in the final version though? 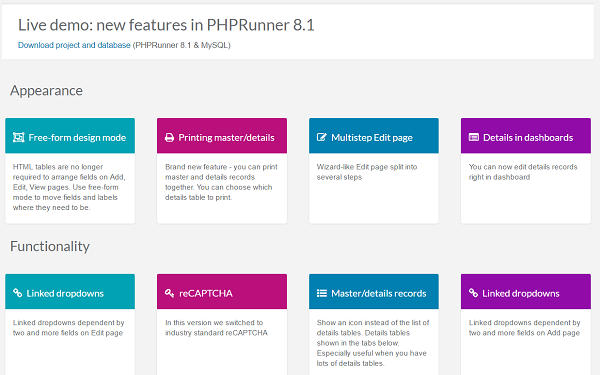 PHP runner is amazing! And is getting better every time. All business is running on data. PHP runner helps unlocking data in a friendly way. Can php runner run in the cloud? Maybe using AWS? When will PHPRunner 9.0 enterprise be available? 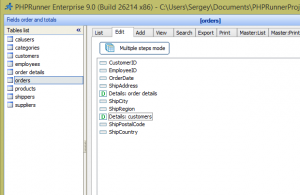 Will items created in 8.1 Enterprise port into 9.0 easily? Love PHPRunner, thanks for it! 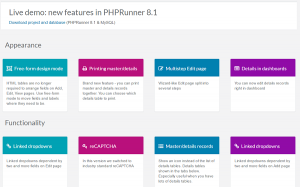 seems like php runner is best of them and have all features i need im using version 9.6 trial. 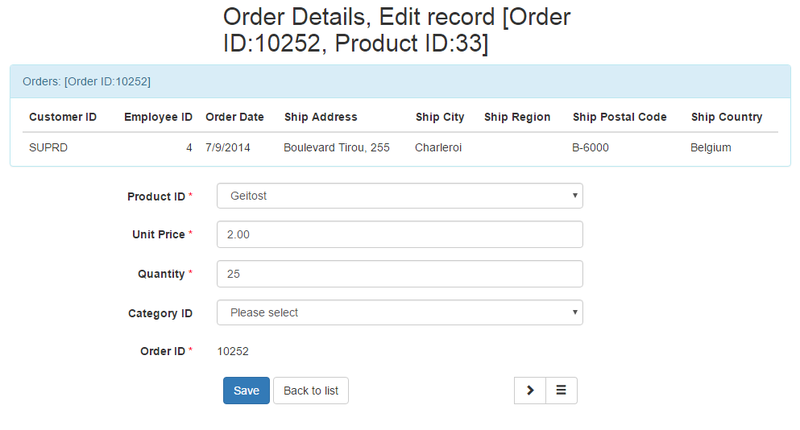 i want to know how many table / records can generated app run? in trial and standard and enterprise or its unlimited? i dont know how many my server can support.